Social media is awesome. Keeping in touch with people you love, getting support from like-minded people in groups you belong to, messages from mum and of course wasting inordinate amounts of time watching cat videos… or maybe that’s just us?! It’s also fantastic for running competitions and giveaways – it’s so good in fact, that some people forget that running a competition on your website, or at least promoting the hell out of it on your website, is an option. So here are 3 reasons (among many) why your competition should have its own landing page on your website. 1. Competition landing pages make your life easier. Want to give your potential entrants more details about the epic prize on offer? Hoping to get people to visit your website? Need somewhere to house the terms and conditions? Create a competition entry page on your website where your audience can find out more about your competition and your business all in one place. If it’s relevant, you can encourage entries on this landing page too – for example a form where they enter their email to win or answer this question to enter etc. You can even embed social media ‘like’ and ‘follow’ widgets. Once on your website, they may head to your about page to learn more about you, browse your blog posts, subscribe to your newsletter or even get in touch with you. 2. Having a landing page for your competition increases brand awareness. A competition landing page has the added bonus of increasing brand awareness for your business as the page will be heavily branded in your fonts, colours, imagery and logo instead of the branding of whichever social media channel you’re using. This is why it’s extra important to prepare your marketing material and messaging in advance, so you maximise brand awareness during the competition. BONUS: when the campaign is closed, your social media posts promoting your competition will still be available and people may click through out of curiosity. 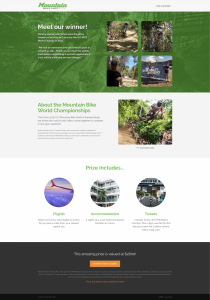 So borrow the tactic we used with Mountain Bikes Direct’s competition and repurpose your landing page to celebrate your winner and post some pictures of them enjoying their prize. Who doesn’t love to see the the real life winner of a competition (even if they did win the prize you desperately wanted to win)? Assuming you have got Google Analytics set up, you’ll know how much awesomely useful information it records about your site visitors, things like their age range, location, how much time they’re spending on your competition page (which by the way is usually at least 2 minutes average with for clients), where they head to next and even what they’re potentially interested in purchasing. Google Analytics is super useful for calculating all manner of metrics for your competition and when we run competitions for our clients, it’s one of the tools we check daily to see how we’re doing, kind of like checking the pulse of our competitions. BONUS: all that awesome, qualified traffic you’re sending to your site also shows Google your site has relevant and interesting content, potentially rewarding you in the SEO stakes. So how do you create a competition page? Log in to the back end of your website and create a new page, making sure you include somewhere for them to enter the competition (or at least find instructions on how to), learn why you’re running your competition, find out a bit about who you are as a business and most importantly – what’s in it for them – what they can win. If you don’t know your html from your elbow, you may have to enlist the help of your developer and if you don’t have a developer, you can still use one of the many competition apps out there that create landing pages for you – though be warned that not going to be as branded as your website and you’ll be losing all that awesome referral traffic. Get us to do the hard work. Seriously, book in a free chat with the competition nerds at OrigamiGlobe, to see how we can make your competition landing page dreams a reality*. *OK, we know you don’t really dream about competition landing pages, only we’re that nerdy. Competition landing pages are a great way to build a deeper relationship with your target audience and potential customers as well as make it as easy as possible for them to find the information they need to enter your competition. It’s a much neater way to keep all of your competition info together plus reinforces your brand awareness – it’s a win win. If you’re sat there thinking ‘well that’s all well and good but I can’t build landing pages!’ then don’t panic. Get in touch with us and we’ll be happy to help you create a wildly successful landing page that converts visitors into entrants.